If you need to locate a particular invoice, there are two ways to do it. If you know which person the invoice was issued to, you can search for it from that person's contact record. If you do not know who the invoice was issued to, you can search through all invoices using the invoice date, invoice number, internal notes, or any other information you may have. If you know who the invoice was created for, follow these steps to display a particular invoice. Find the person within the contact list. Click the contact within the list to display their contact record. Within the contact record, click the Financial transactions link at the top right. All invoices belonging to the contact will be listed. The number of invoices found appears to the right. Any notes that were added to invoices will appear below them on the results page. If there is an outstanding balance, an exclamation mark icon will appear in front of the date, and a Record payment button will appear under the Status column. You can filter the list by clicking the Filter drop-down and selecting the type of invoice you want to display, and by entering a keyword in the Search field. Once you have found the invoice you are looking for within the list, click on it to display the invoice details. If you want to find a particular invoice but you do not know who the invoice was issued to, you can display all invoices then filter the list using what you know about the invoice. 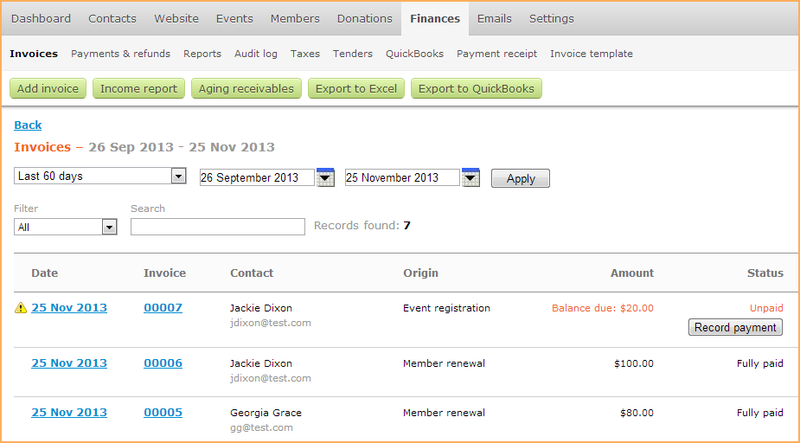 To list all your invoices, hover over the Finances tab and select the Invoices option. The number of invoices found appears to the right. Any notes that were added to invoices will appear below them on the results page. If there is an outstanding balance, an exclamation mark icon will appear in front of the date, and a Record payment button will appear under the Status column. You can filter the invoices list by date, by invoice type, or by entering a search keyword. To filter by date, choose a range from the Select range list, or select your own date range using the calendar controls, then click Apply. To filter the list by invoice type, click the Filter list and choose the invoice type. You can further filter the list by entering a keyword or phrase in the Search field. You could, for example, enter the invoice number. Only those records that match the word or phrase will be listed. Once you have found the invoice you are looking for, you can click on it to view the invoice details.